Farofa is a dish made from toasted manioc flour and complements that may include bacon, onions, parsley, diced boiled eggs, meat, bananas or vegetables and almost anything that strikes the cook's fancy. 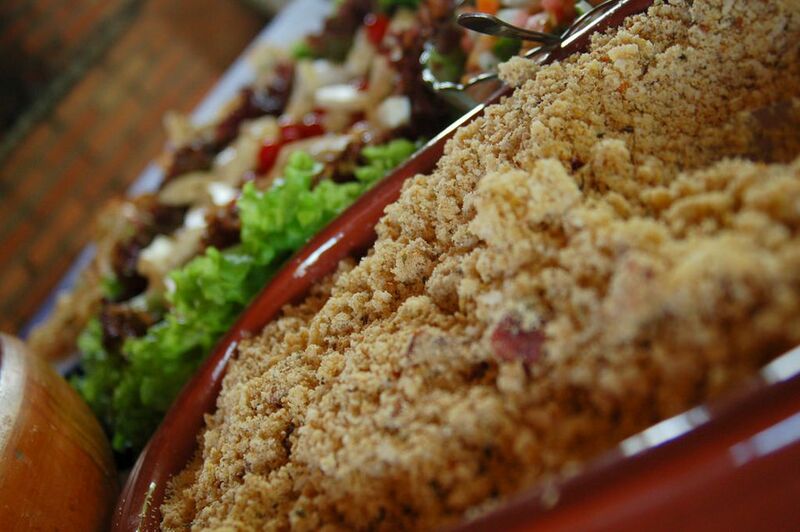 A widely popular dish, farofa is best with beans, which in Brazil are usually served in their cooking juices, or meats such as turkey, grilled beef, pork or fish. Farofa is a common dish at barbecue parties or barbecue stalls at food events when hot meat kebabs are rolled in it for a crisp coating. In Brazil,​ farofa is also a derogative slang term for a cheap day trip to the beach, especially one in which people eat a picnic on the sand and don't pick up their trash. Someone who does a farofa is called a ​farofeiro. Low-income beachgoers, who can't afford to stay overnight, will sometimes take an excursion bus for the day and also pack a lunch - a plastic bag full of farofa to go with a container of chicken being a cheap option, hence the term. In 1985, Brazilian band Ultraje a Rigor had an instant hit with the song "Nós Vamos Invadir Sua Praia" ("We're Gonna Invade Your Beach"), from the album by the same name, which pokes fun at the fear more affluent beachgoers have of the day trip crowds. The beachgoers in the song are bringing farofa, galinha, and a vitrolinha - farofa, chicken and a portable LP player.